Laser Resources’ partner, Laservision has come a long way from the look of the first laser safety goggles to the design of the PROTECTOR (L-08). The first glasses looked like divers' goggles and they were continuously fogging up because their side protection was good but tight. The PROTECTOR (L-08) belongs to a new genera­tion. It offers comfortable all-round protection and also has small, cleverly devised vents. 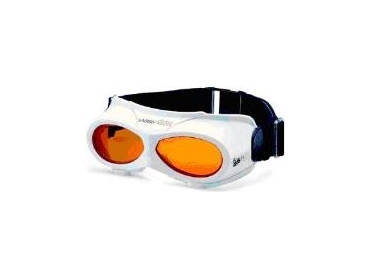 Due to the angle of these vents they are laser safe and prevent the goggles from fogging up. This frame style fits well over prescription glasses. The PROTECTOR (L-08) is an ideal solution for all applications with multiple users of the glasses as in universities, or for protecting visitors.